Sanyo PLV-Z700 review | What Hi-Fi? 2009's Award-winning budget projector turned in a mightily impressive performance to take the projector crown, delivering pictures that, just a couple of years ago, would have required a far more serious downpayment. 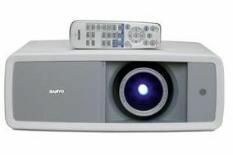 The Sanyo partners staggeringly good-value performance with simple set-up – a simpler blueprint for projectors doesn't exist. It doesn't get any easier on the eye, however. The white goods styling and considerable bulk mean, while the price screams accessibility for all, it will require some accommodating. Still, in terms of performance the no-nonsense design bodes well. The clunky looks don't mean a cumbersome set-up procedure – the illuminated remote even means you can do it with the lights off. Picture-shift controls are on one side of the unit, focus and zoom on the lens itself. This LCD projector has a Full HD 1920 x 1080 display, twin HDMI inputs, a claimed brightness of 1200 ANSI lumens and a contrast ratio of 10,000:1. As an added bonus, it's nice and quiet in operation, running at a barely audible 21dB. We settle in to some of the Blu-ray release of The Sopranos and the Sanyo delivers a splendid picture. The transfer of the disc itself isn't flawless but this projector manages to get more from it than any rival we've seen, and by some distance. It takes a minimum of tweaking to get a beautifully natural, involving colour palette from the machine, which ensures subtle, balanced skin tones, solid black levels and colourful, punchy bright scenes. There's a real feeling of depth to the picture, and a sense of three-dimensionality normally reserved for more expensive projectors. Switch to the cold and clinical action of Moon and the Sanyo flexes its muscles to deliver impressive insight and contrast levels. Faces have texture, with every pore and hair uncovered, while bright scenes with powerful whites – of which there are plenty – have enough detail to uncover the nuances within blankets of colour. Sanyo's PLV-Z700 is a truly accomplished projector for the money. The styling of the box might not be up to much, but when it delivers such an insightful, colourful and classy picture, who's going to be looking at the box?